The Walking Golfer was invited to Huntsman Springs for a “media day”. I had the pleasure of playing the course three times – walking twice and riding once with other media members and Jimmy Kidd. 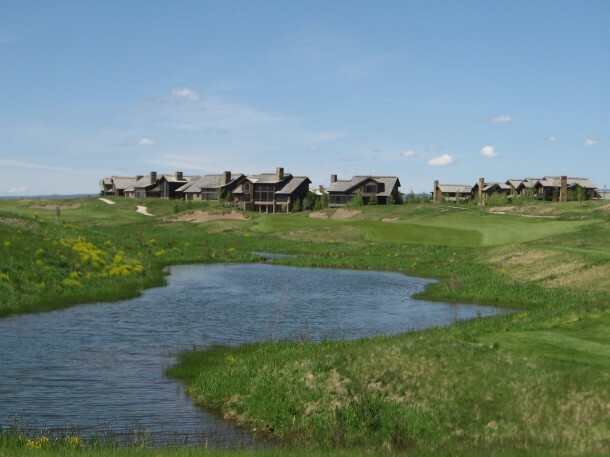 Huntsman Springs is a master planned community in Driggs, Idaho that has been financed by Jon Huntsman, former CEO of the Huntsman Corporation and founder of the Huntsman Cancer Institute in Salt Lake City, Utah. All proceeds from Huntsman Springs will be donated to the cancer institute. 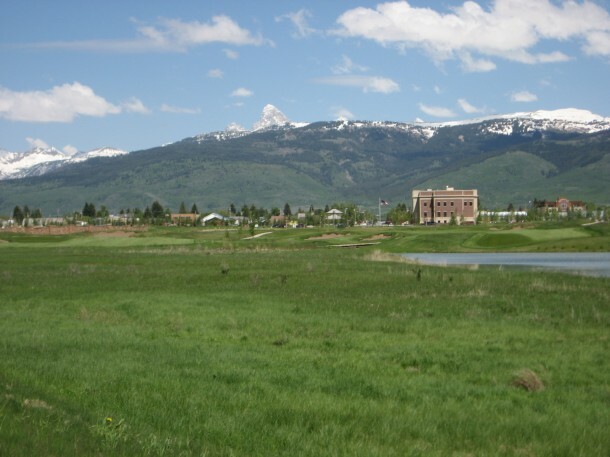 The community is located in the shadow of the Teton Mountains in a valley between the watershed and wetland edge. 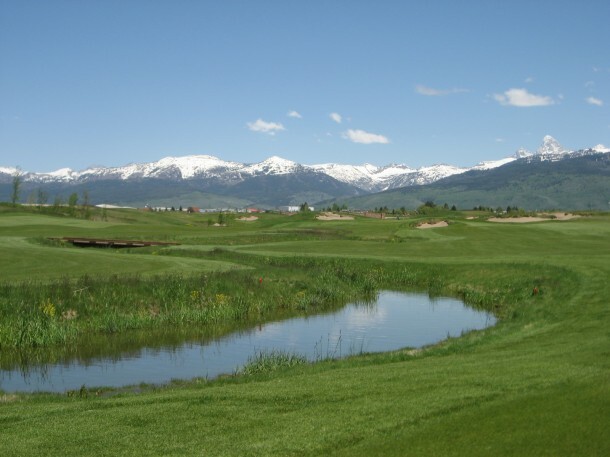 The location is absolutely beautiful and it is the type of place that families will enjoy visiting for generations because of all the activities, such as golf, hiking, fishing, biking, etc., that are available. 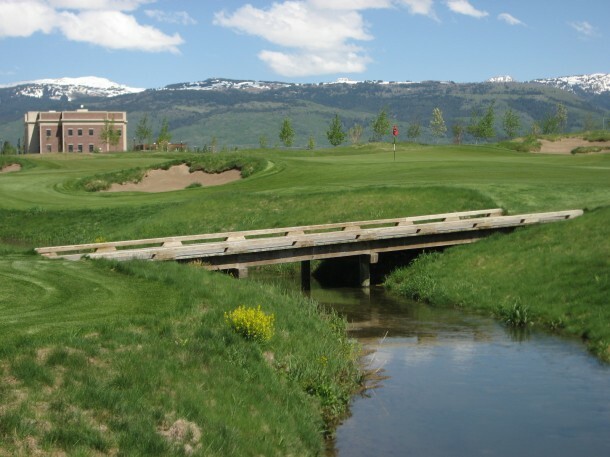 DMK Golf Design created both a golf course and an engineering marvel at Huntsman Springs. 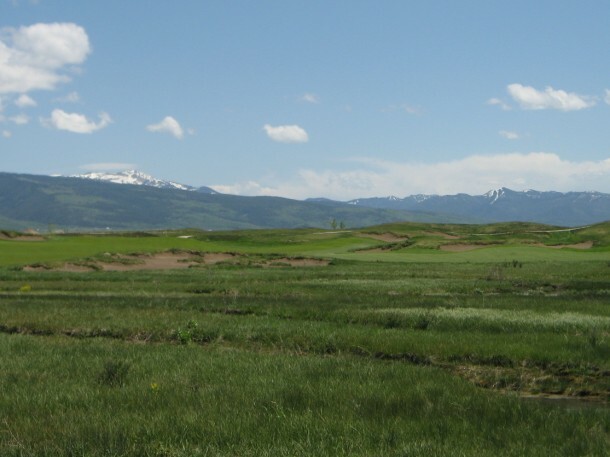 When David McLay Kidd arrived on the site it was admittedly a “1 or 2 out of 10” because the land was extremely flat and very wet with run off from the mountains and natural wetlands bordering the property. The Huntsman’s thoroughly supported DMK’s vision for the land and admired his passion for the complex project. 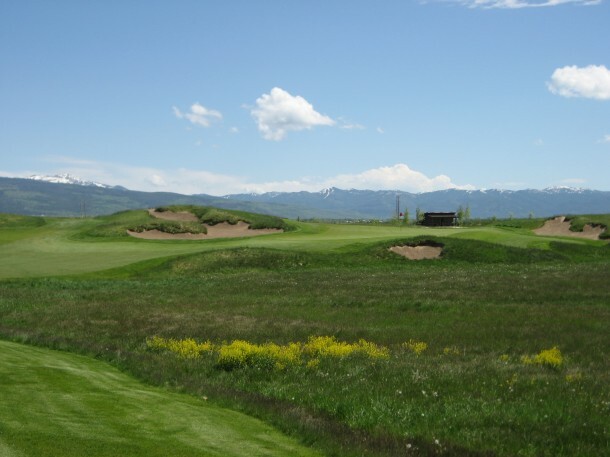 David McLay Kidd and Lead Associate Nick Schaan worked with Jim Haley of Highland Golf to move about 4 million cubic yards of earth to facilitate the construction of the course. Essentially, they moved tons of dirt from the “slightly higher” points on the site to the “lower” points to create playing corridors that worked with the evolving community master plan. 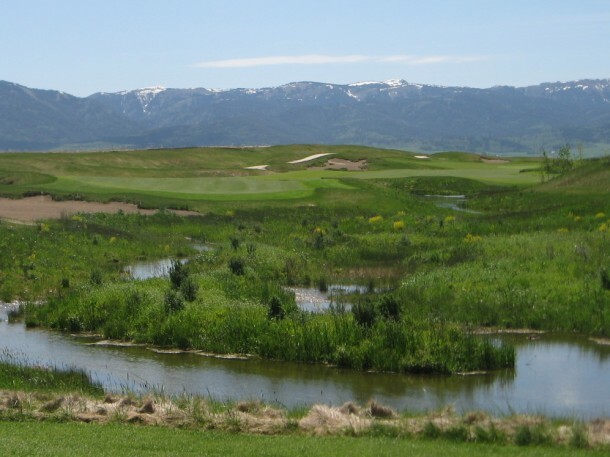 By artificially dragging the wetlands through the golf course it enabled a huge amount of natural run off from the mountains to flow through the property. The availability of almost limitless sand and gravel also allowed DMK and his team to plait the course with 9 inches of sand. 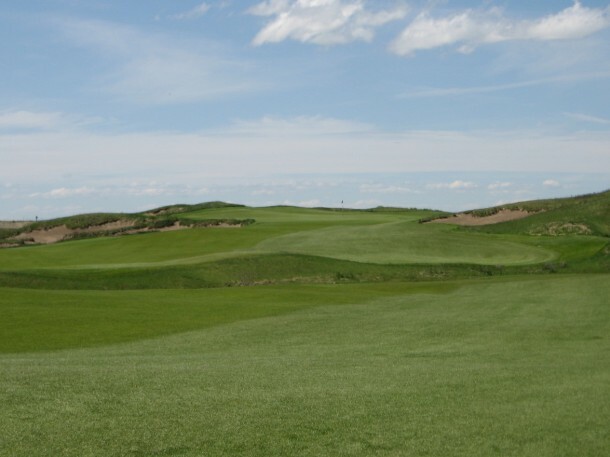 Similar to their efforts at The Castle Course in St. Andrews, the team’s first priority was creating a site suitable for golf and then shaping it to create something that would be enjoyable for members to play again and again. Enough water flows through the course in a day to irrigate it for a year. 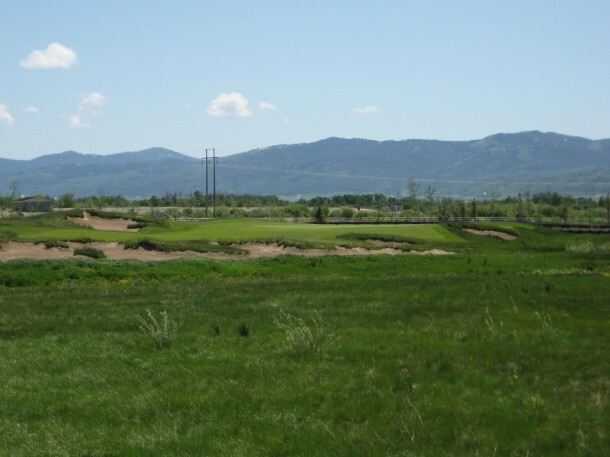 Huntsman Springs Golf Club now sits on 320 acres as it winds in a figure eight away from the town and through the wetlands before returning home on each nine. 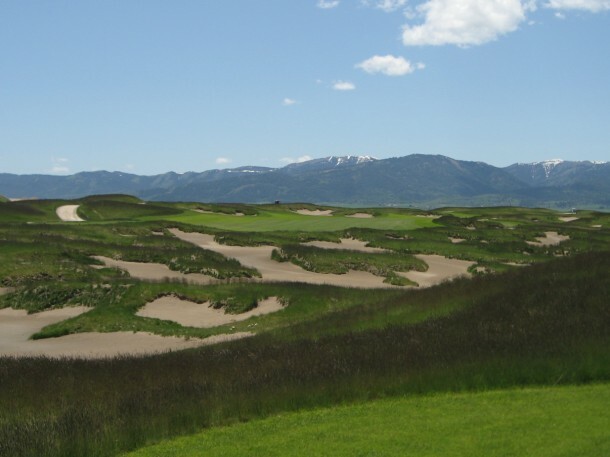 The incredibly cold winters led renowned agronomist Jimmy Kidd to select a blend of bluegrass and creeping bents for the fairway and rough, creeping bents for the greens and a fescue blend for the outer rough. 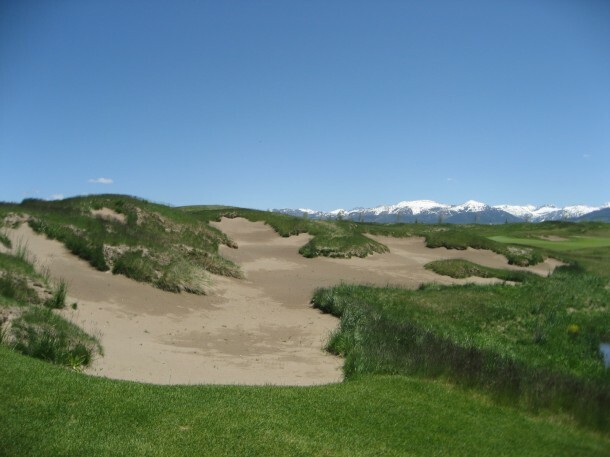 The thick sand base allows the bluegrass and bent to play very firm and faster than one might expect. Superintendent Guy Johnson and his team have done a wonderful job of preparing the course for play after a long winter and wet spring. The fairways and greens are both very pure and will provide excellent playing surfaces when they can be cut just a bit lower. 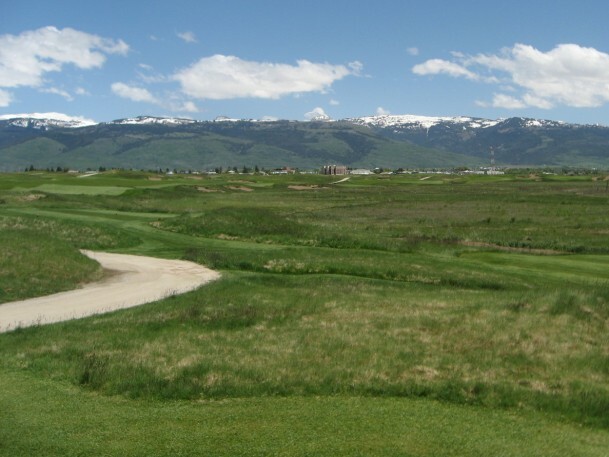 Walkability was not a priority at Huntsman Springs and while that does show, the course is walkable for those golfers who are in shape and inclined to do so. With the addition of a few more footbridges and walking paths the course would be a much easier walk. 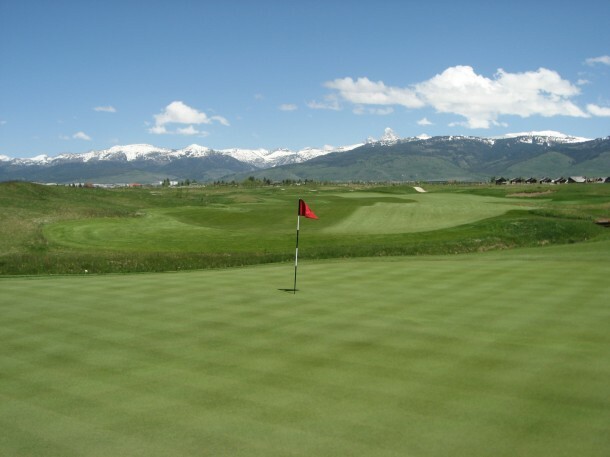 I do agree with Jimmy Kidd, for the walker, a round at Huntsman Springs should be treated as an “experience in nature.” Some of the green to tee transfers are longer than one would like, but many of them cross boardwalks above the wetlands with the mountains in the distance, raptors circling overhead and trout swimming nearby. 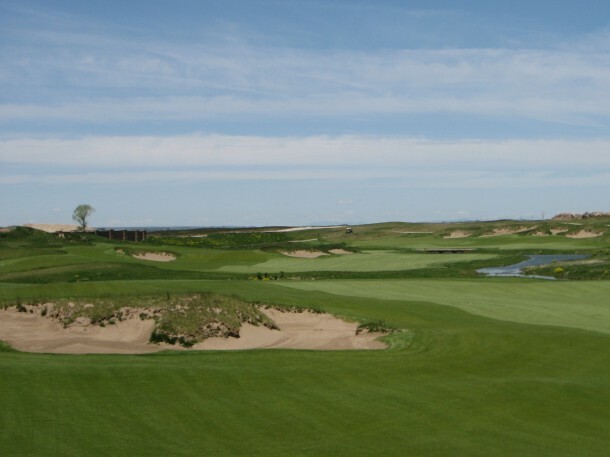 The round opens with the first of many drives over water to a wide fairway that presents options depending on how much risk the golfer is willing to take on. Usually, a wood aimed at the bunker in the middle of the fairway in the distance is a good play. 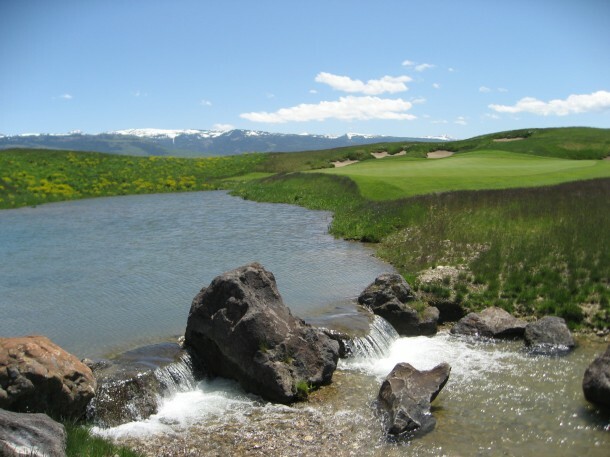 Remember that Huntsman Springs is located at about 6k feet so the ball will fly an additional 10% or so farther than at sea level. The 1st green, like many, is protected by a bunker that lies at the mid-front. The putting surface is 42 yards deep so there is plenty of room to fly the bunker and let your approach roll out to the pin. The 2nd tee shot is easier than it looks but still no pushover. It is 240 yards to carry the water to the second fairway from the “I” tees and 157 yards from the “IV” tees. A drive must be long and accurate to avoid the water short and left. 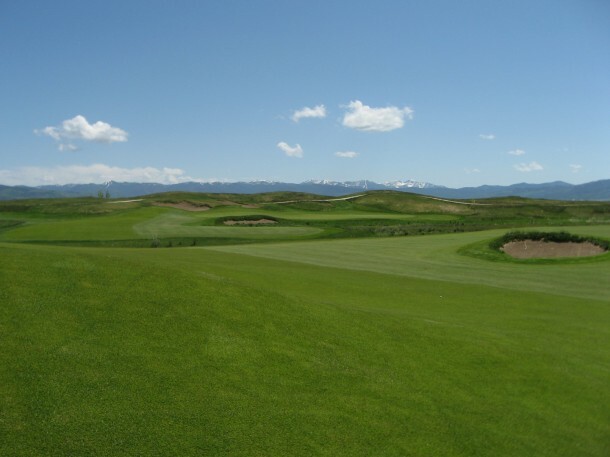 The short hitter must lay up which turns the hole into a three shotter as the burn runs in an “S” from the tee up the fairways and in front of the green. 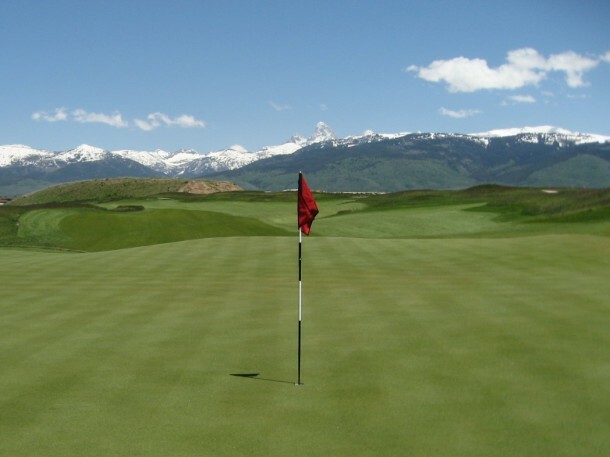 The view back from the second green is breathtaking with the Tetons in the distance. The up and back mowing pattern on the fairway fits in nicely with the environment and I much prefer it to the usual cross-hatch pattern. There are a few tee shots at Huntsman Springs that make the golfer scratch their head in wonderment as to where to hit the ball. 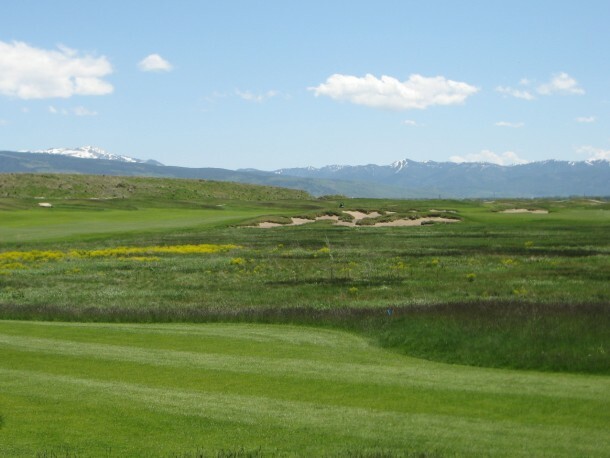 After a round or two, members will be accustomed to the visual confusion that Kidd presents at Huntsman which can also be found at many of his other courses. Multiple options exist off the tee on almost every hole and there are quite a few on the 3rd. 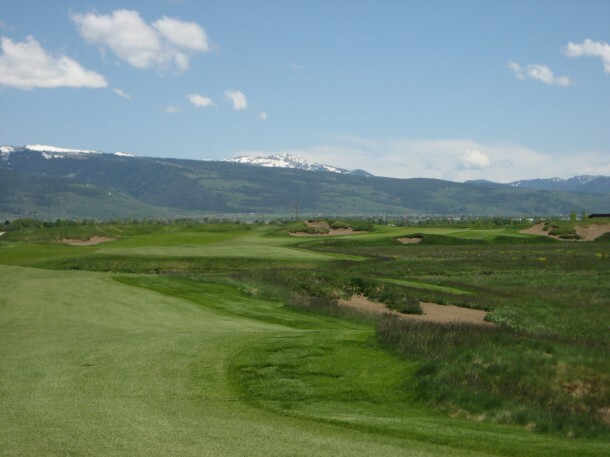 The fairway is probably about 100 yards wide with bunkers strategically dotting the landscape. There is water beyond the fairway 261 yards off the “I” tees which should keep driver in the bag and put a fairway wood or long iron into play. An accurate tee shot will leave a wedge to the green. 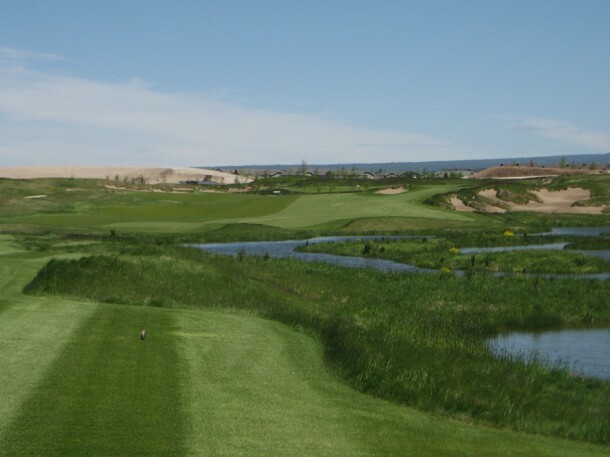 At 596 yards from the “I” tees the 4th is the shortest three shotter on the course but it plays like a beast as the hole doglegs from left to right around the wetlands. A three wood may suffice for a tee shot that places more focus on accuracy than distance. After a safe drive, a mid to long iron second is necessary to thread the needle up a fairway that continues to narrow as it gets closer to the green. The final approach will probably only call for a wedge or short iron so birdie is certainly possible. 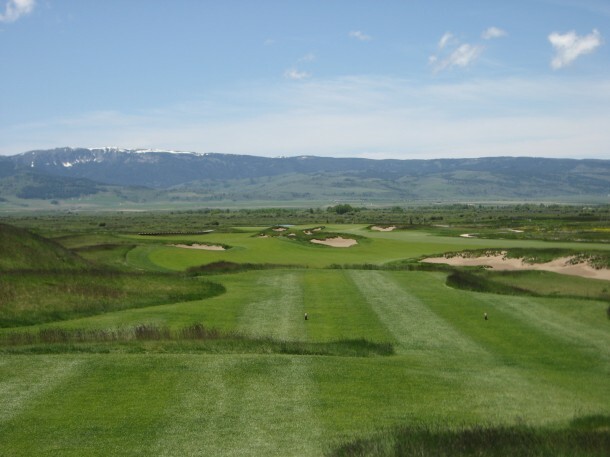 The 4th is a tricky par 5 that will see a wide range of scores. 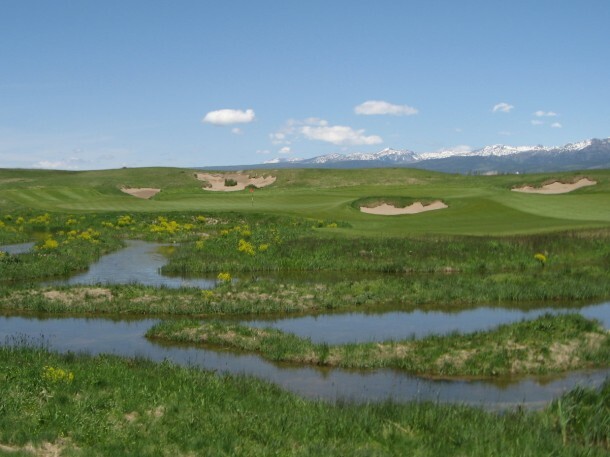 The 5th is the only one shot hole that traverses mostly wetlands instead of water, although a hazard is a hazard. There is plenty of room to run the ball up onto the green and it is wise to play short if there is a tailwind. The walking golfer is faced with a long hike around the wetlands and across a boardwalk to reach the green, unless he can find a route through the wetlands (which I was able to) that can cut the walk in half. Be careful, it is pretty soggy most of the year and you do not want to lose your shoes in the muck. Two fairways await the golfer off the tee. The left is much closer but forces an approach over a pot bunker. The right side leaves a great line into the green but a big hit is needed to cross the pond. The wetland, creek and pond will gobble up a lot of golf balls, although the left side fairway is quite wide. A big drive down the right leaves a pretty easy pitch or bump and run. Club selection is important again on the 7th because a big drive can run over the edge of the fairway into a creek. A 3 wood or long iron will probably leave a short to mid-iron approach to an elevated green. The green is open on the front and there is a bail out area to the right side while bunkers await on the left. The 8th is the toughest par three on the course because the green is challenging to hold, especially with a longer iron. There are a couple of big swales on the green that provide distinct pin positions. While the 9th plays really long, it may be reached in two with a couple of flushed and accurate strikes. Off the tee, the bunkers in the distance seem to ring the green, even though they are about 150 yards in front of it. Kidd and team did a good job of creating depth perception issues for the golfer which I believe adds interest to the routing at Huntsman Springs. 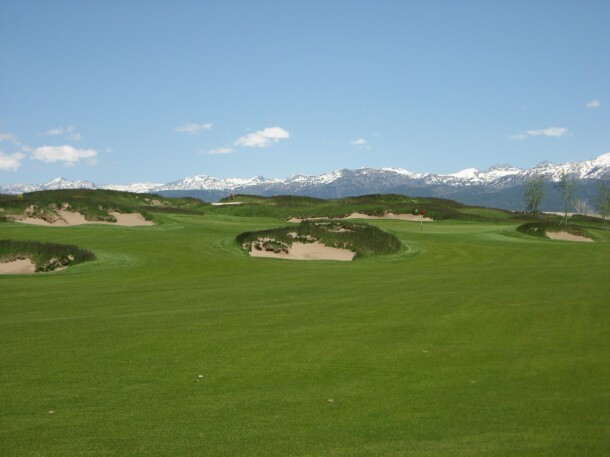 A layup over the bunkers will leave a short pitch to the green which slopes from back to front. Once again, a single fronting bunker dominates play into the green and makes reaching in two a challenge. The 9th and 10th present back to back par fives over 600 yards. 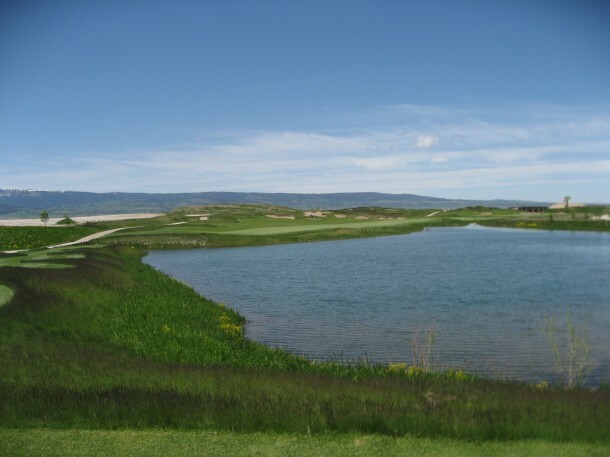 The 10th is quite a bit more difficult because water is in play on every shot. A brave tee ball flighted to the right of the forward fairway bunker will leave an easy layup to the second fairway island or long bomb to the green. The water and the sand make every shot on the hole appear scary but there is plenty of room to work your way towards the green. A long second awaits with water crossing and lurking right. A par on the 10th means you have shown excellent ball control from tee to green. The 11th calls for a short to mid-iron over a pond to a green with a great backboard so don’t be afraid to play it a bit long. The green is big so if you are on the wrong side a three putt is certainly a possibility. The 12th is a really fun driving hole because the golfer can hit to the right, left or over the bunkers that look so daunting from the tee. The bunkers appear much closer to one another on the tee but from the fairway you can see that the two fronting the green are 200 yards away. The green is very wide so approach shots can have a 50 yard variance in distance depending on pin position and angle. Despite the ominous look of the bunkers and wetlands there is plenty of room to play safely to the right side of the pot bunker in the middle of the fairway. Take in the view before teeing it – a more beautiful backdrop would be tough to find. Once again, the green’s main defense is a pot bunker on the front. The putting surface is a fun one with a biarritz inspired ridge running north/south through the green which creates several distinct levels. 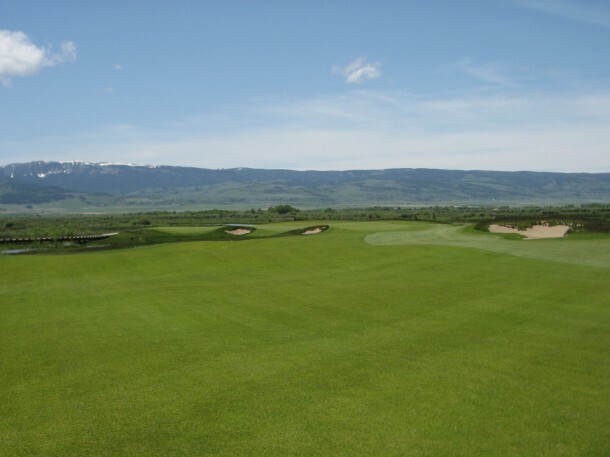 The golfer plays back towards the 13th tee and across the valley with a fairway wood or driver on 14. The mid to short iron approach comes into an elevated green that slopes from right to left and front to back. The green is very deep at 57 yards but “flat’ish” compared to others on the course. The 15th is a reachable par five if you hit a long ball over the bunkers. There are three distinct plays with your drive – safe left, long and straight, or long and right, which can bring a fairway pot bunker into play. The green is protected by wetlands on both sides but there is some room to run the approach on the front if you are approaching from the right angle. The 16th is a fun short two shotter with a left or right fairway decision off the tee. 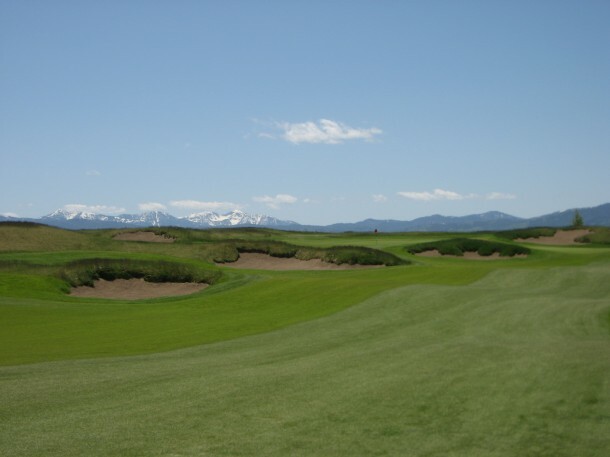 The large fairway is split down the middle by a stream which will gobble up indecisive shots. The ideal side to approach the green from is dictated by pin position with the right fairway being a good bail out because it is easier to hit. The final one shotter comes on the penultimate hole and it is a pretty one. Usually no more than a tricky half wedge, the pond in front of the green probably sees a lot of action. There is a great backboard, similar to the 11th, which will help a long tee shot roll back onto the green. 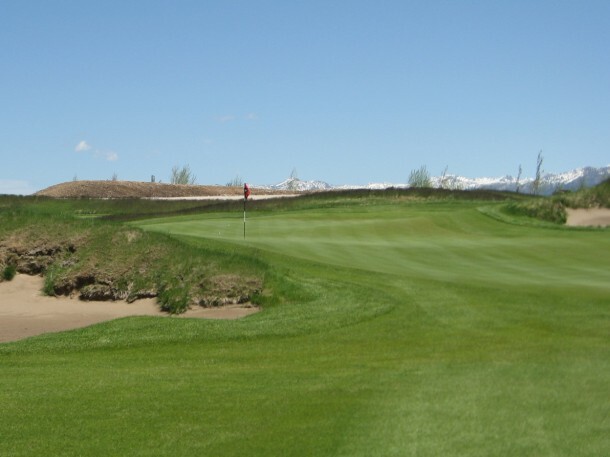 The top right pin position, behind the bunker, is a local favorite and a lot of fun to try and hit at, or putt up to. Finishing up with a driveable 400 yard par four is a blast. 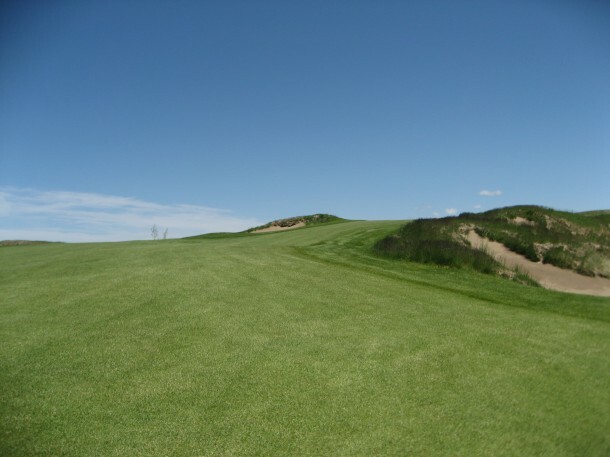 If the wind is against then a drive to the left side of the fairway is ideal because the shot from the right is blind. 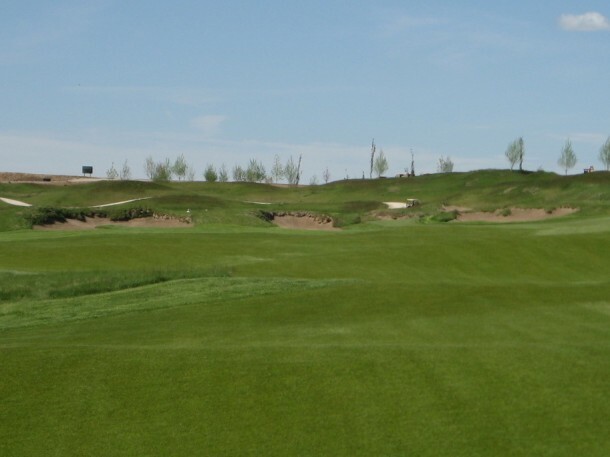 To drive the green, a long and straight hit over the edge of the large right side waste bunker is required. Anything that comes up short will find the nasty bunker pictured below. The bunkering at Huntsman tends to suit the land quite well. A drive short and right will leave a blind approach past two fairway bunkers and a green side bunker to reach the putting surface. A blind approach from the right side punishes a drive pushed and short. There is plenty of room to run the ball on from the right side but the left is guarded by a deep greenside bunker. Plenty of room for a running approach - just avoid the bunker. A round at Huntsman Springs is enjoyable but the walk is admittedly challenging. 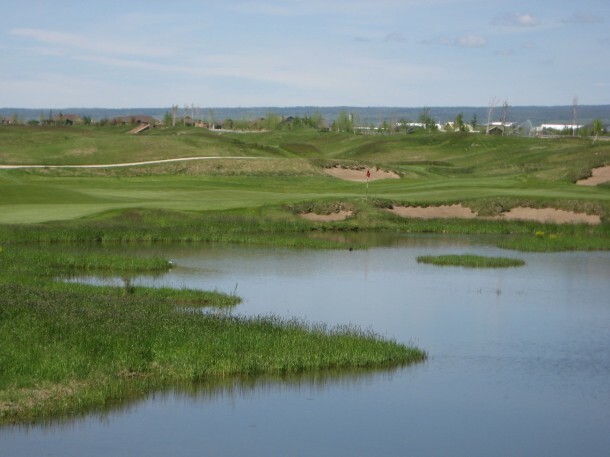 DMK Golf Design have done a solid job of creating a fun course on a site that was a flat wetland before they started. 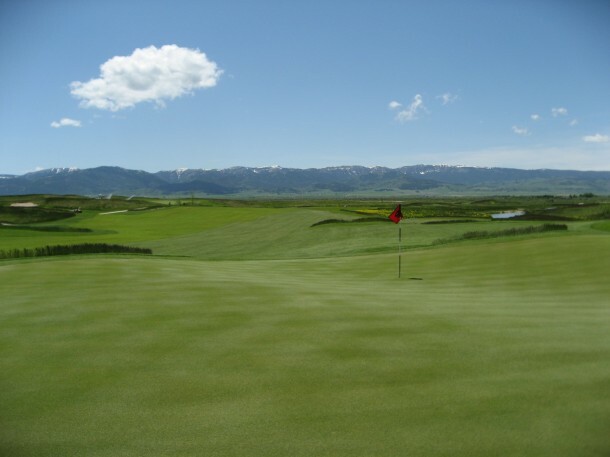 While it is completely manufactured, the rolls and undulations do have a natural feel to them and I believe the course will only improve over time as it matures. 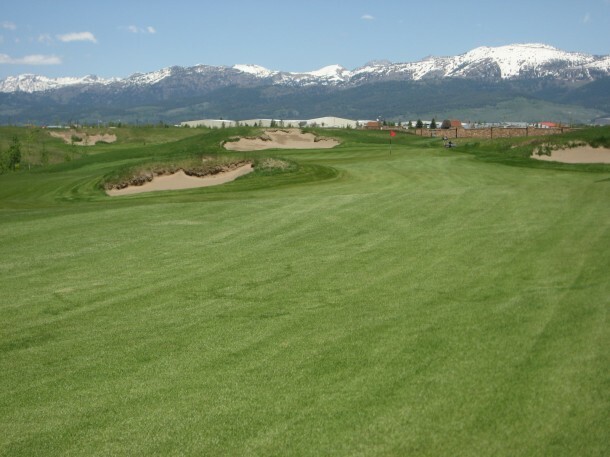 The empty spaces available for housing tend to detract from some of the views and this is one of few courses that will play just as well with homes because the lots are inside the routing in most places with the course looking out towards the mountains. In terms of Walkability, I would rate Huntsman Springs 2 out of 4. 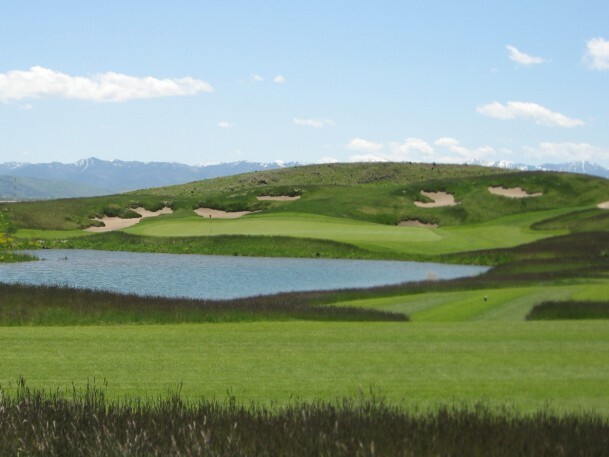 While a walkable course was very low on the list of priorities, the architect did a pretty good job of making it possible despite all the water. As mentioned, a few more footbridges and paths would make the walker feel more welcome. 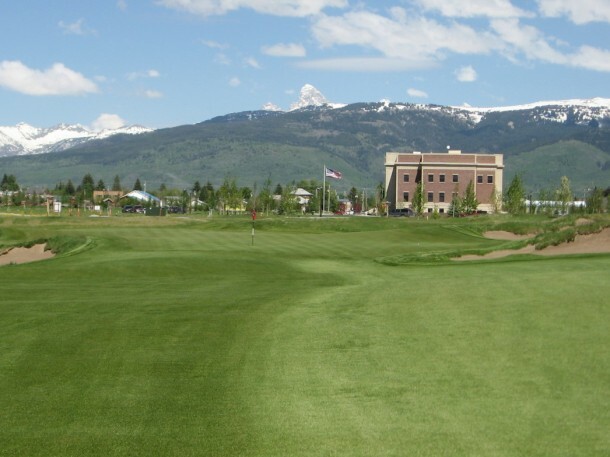 If you want to walk at Huntsman Springs, make sure you are in good shape, and enjoy the journey through nature as you gaze out at the Tetons and take in the fresh air. The surrounding aesthetics at Huntsman Springs are beautiful while the internal aesthetics are quite nice as well. 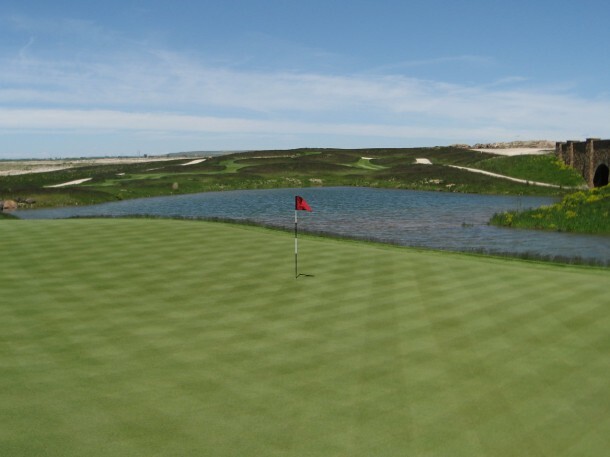 Although, at times, the course is battling a manufactured element as mentioned, the team have done a solid job of integrating the course with the environment. I thought the architecture was good, but not great, because repetitive bunkering and water hazards come into play again and again. 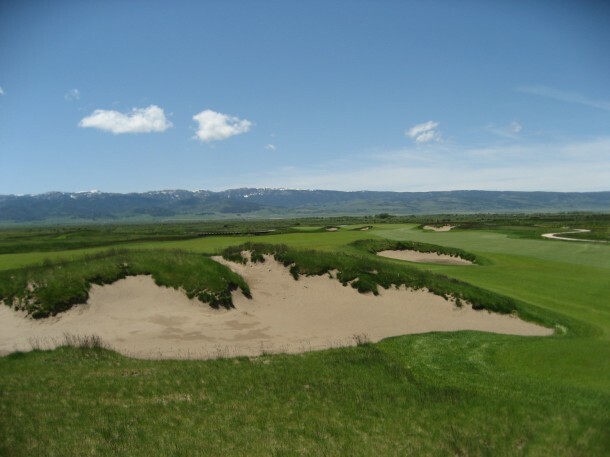 The natural sand in the bunkers was a nice touch as bright white sand would not have fit in at Huntsman Springs. The grass selection really makes sense for the climate and the turf plays very well making bump and run shots a possibility. The greens are quite firm right now, which is just fine, but they will soften up over time. The most compelling element of the architecture is the big greens that have movement but are very fair and puttable for golfers of all levels. I would rate Huntsman Springs 3 out of 4 for Architecture and Aesthetics. 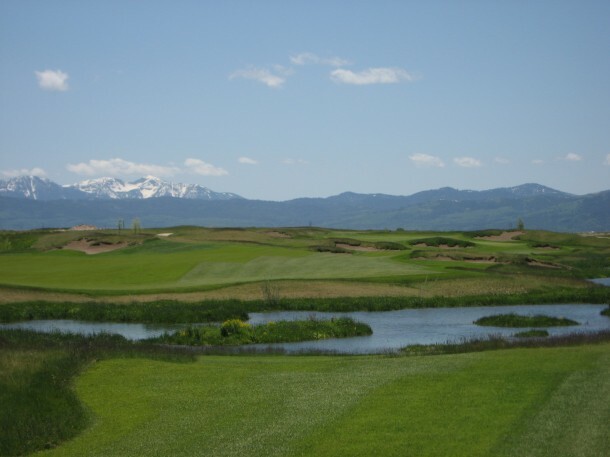 With the amount of water that comes into play, Huntsman Springs is quite playable and there are a ton of strategic options which, in many ways, is David McLay Kidd’s calling card. There are at least two routes to take off the tee on almost every hole, often more, and various ways to approach the green as well. 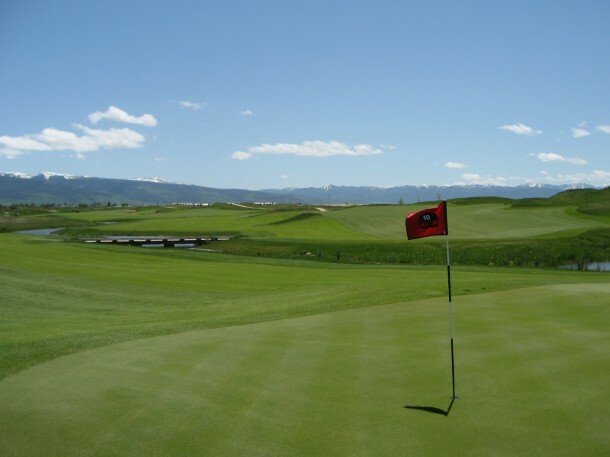 A good stick can go low at Huntsman with solid ball control and a higher handicapper should be able to get around just fine if they play the appropriate tees. 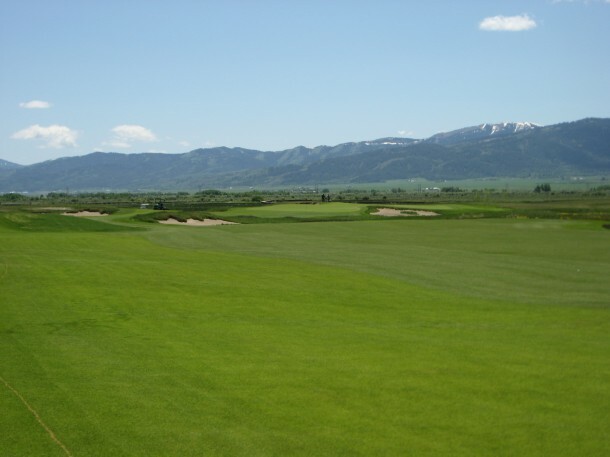 The course was designed with the 18 handicapper in mind which led to the wide fairways and large greens. I would encourage most golfers to bring a “ball retriever” because the water is usually pretty shallow and it will help you save on ammo. I would rate Huntsman Springs 1.5 out of 2 for Strategy and Playability. 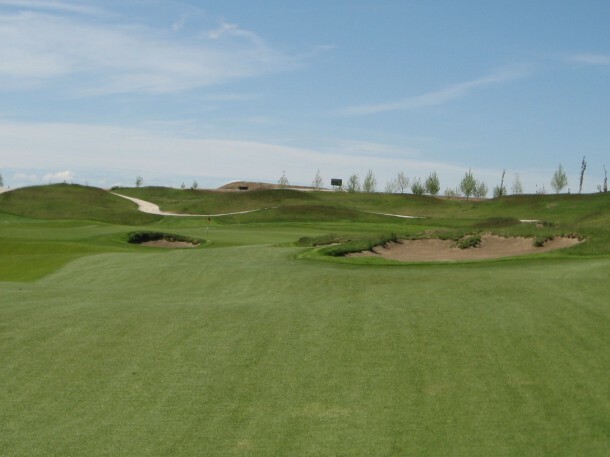 Overall Hunstman Springs is a 6.5 out of 10 for The Walking Golfer. 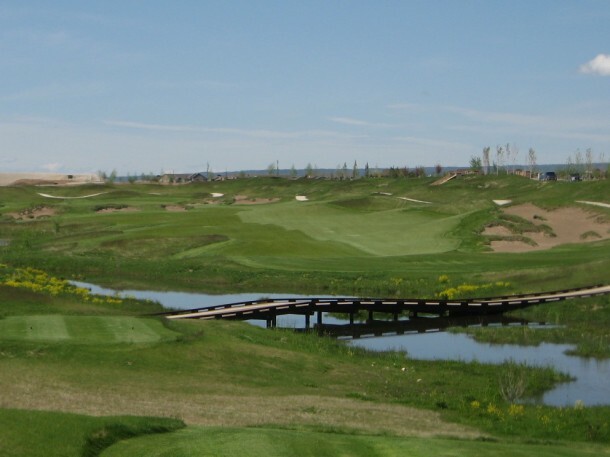 The course loses points for Walkability and then rates 4.5 out of 6, or 7.5 out of 10, for Architecture, Aesthetics, Strategy and Playability which is very respectable, especially given the site that Kidd and team had to work with. 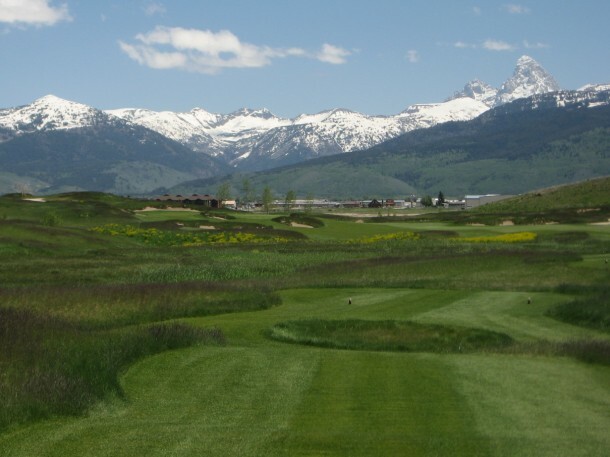 If you are near Jackson Hole, WY or in Driggs, ID then stop by for an enjoyable round at Huntsman Springs. Tony Snoey and the staff are wonderful and Guy Johnson and his team keep the course in immaculate shape. 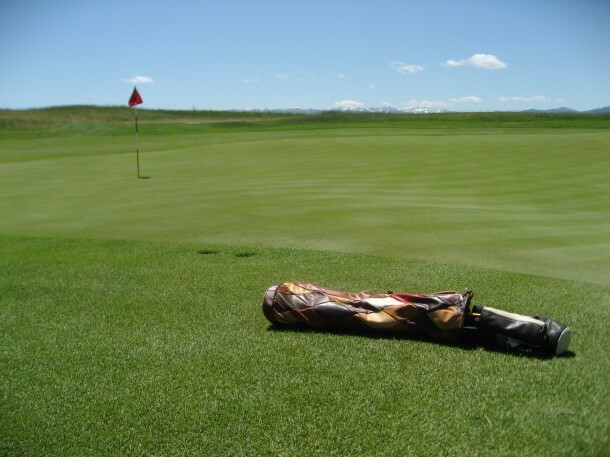 Previous Article← What is in The Walking Golfer’s Bag?